Make sure that everyone in your establishment understands the correct way to prevent cross contamination or bacterial spread with our Clean Your Hands Deb Dispenser Back Board. Designed to be loaded behind your soap dispenser, these clearly designed boards explain how to effectively wash your hands in a step-by-step process that is easy to follow. An encouraging step to your current hygiene program, these simple back boards are quick to install and can be wiped clean in the same manner as your dispenser - with antibacterial wipes or spray. 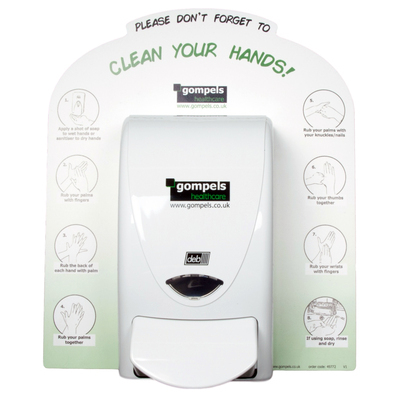 Made from a rigid foam that promises not to lose its shape or look unprofessional, introduce the idea of effective hand washing to younger nursery children or introduce a new step to your hygiene policy at work with a board that stands out from the conventional tones of most bathrooms.